Seaspan Corp. (SSW) is the world’s largest independent owner, operator and manager of containerships. 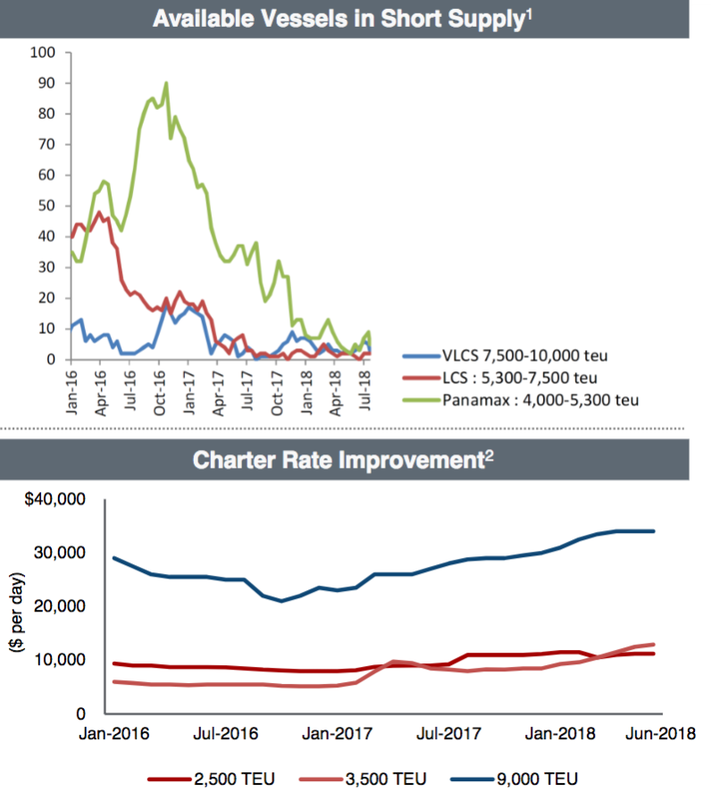 It has an average of ~4.75 years remaining on its long-term charters, which represent 90% of its revenue. The company has had its ups and downs over the past few years and actually cut its common dividend from $.375 to $.125 in April 2017. SSW-H has done well for the Hidden Dividend Stocks+ portfolio, delivering a total return of 11.35%, since we added it on 1/10/18. SSW had very strong Q2 ’18 earnings, with revenue up 37.7%, EBITDA up 16%, and net earnings up 140%. CAFD slipped 5%, but was up 38% vs. Q1 ’18. Q2 ’17 also had a one-time $31M asset sale gain. SSW’s new vessel assets really kicked in for Q2 ’18, which ramped up revenue, EBITDA, and CAFD big time vs. Q1 ’18. Net earnings were up slightly, vs. Q1 ’18. In late March ’18, management announced that it had acquired the remaining 89% it did not own of Greater China Intermodal Investments LLC (“GCI”) from affiliates of The Carlyle Group and the minority owners of GCI. “GCI’s fleet of 18 modern containerships is comprised of high quality 10,000 TEU and 14,000 TEU eco-class vessels, representing a total of 204,000 TEU. Of these 18 vessels, there are currently 16 on-the-water vessels with the remaining two newbuild vessels scheduled for delivery during the second quarter of 2018. 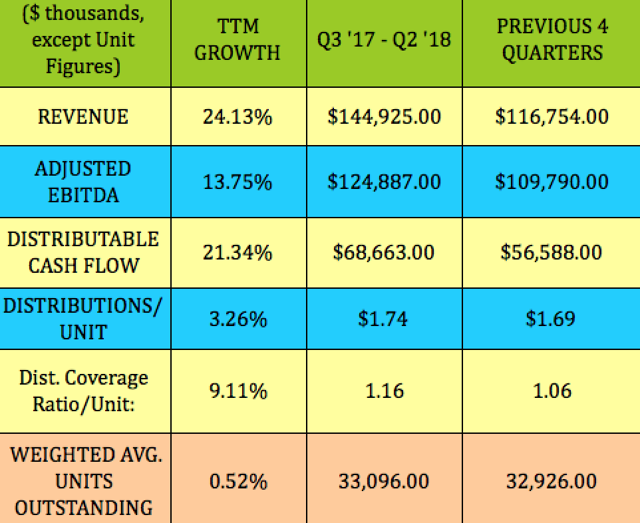 Management issued Q3 ’18 guidance, which indicates that revenue will increase again in Q3 ’18, although at a slower rate, to at least $291M, vs. $282M in Q2 ’18. 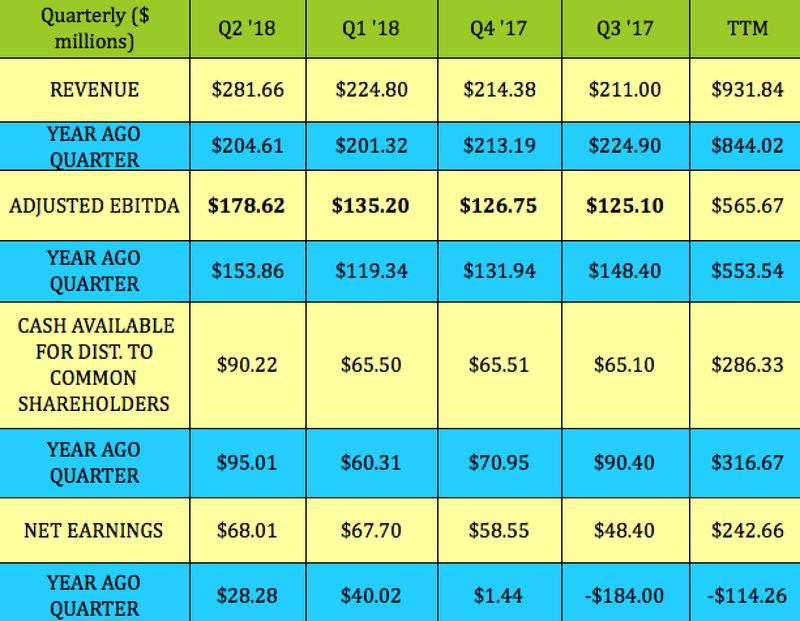 The lower end of the expense items ranges listed below are roughly in line with those of Q2 ’18, which suggests that SSW should have another solid earnings quarter. These are cumulative shares, meaning that Seaspan must pay you for any skipped dividends, before paying common dividends. In addition, they rank senior to the common in a liquidation scenario, and they have much better dividend coverage. At $25.35, the current yield is 7.77%. The call date isn’t until 8/11/21, and there’s no maturity date. 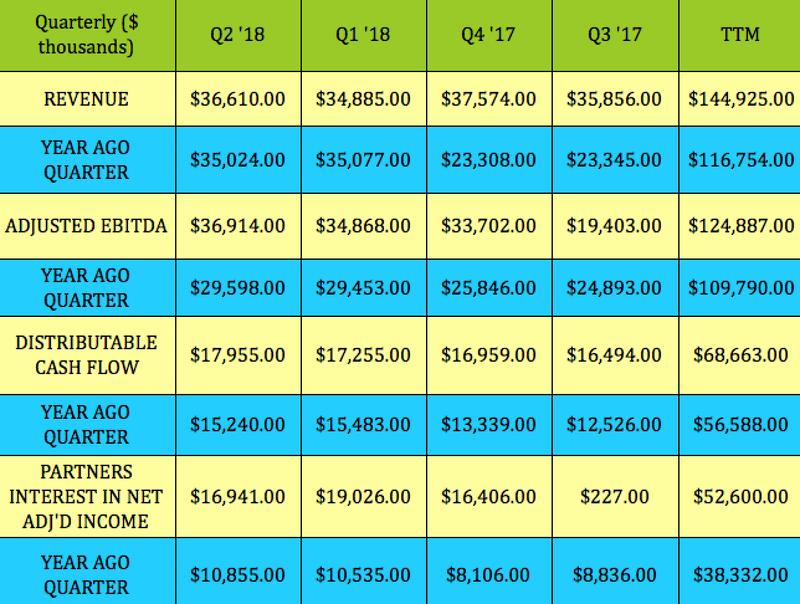 This table details your annualized yield to call date, if SSW’s management were to redeem these shares on the 8/11/21 call date. Since they’re only $.35 above the $25.00 call price, the annualized yield to call date is 7.43%, not too far below the current yield. SSW has 3 other preferred series, (SSW.PG), (SSW.PD), and, (SSW.PE), but two of them are either past or are approaching their call dates much sooner than SSW-H. SSW-D’s call date was 1/30/18, and it’s still selling for $25.37, $.37 above its call price, while SSW-E’s call date is on 2/13/19, and it’s selling for $25.72, $.72 above its $25.00 call price. SSW’s dividends are reported on a 1099, not a K-1, and are treated as qualified dividend income. A Non-Corporate U.S. Shareholder must hold the Seaspan Shares for more than 60 days during the 121-day period that begins 60 days before the ex-dividend date. However, if the dividend payments exceed SSW’s earnings, they are treated as a non-taxable return of capital. Dilution of common shares – As we noted above, we went with the preferred shares, since there will be dilution to the common shares, due to warrants issued earlier in 2018. In mid-February 2018, management announced that Fairfax Financial Holdings Ltd, run by billionaire Prem Watsa, made a US$250 million investment in Seaspan 5.5% interest bearing unsecured debentures, and Class A Common Share purchase warrants. With ~146M shares (diluted average), currently outstanding, the additional 38M and 25M common share amounts represent a ~43% potential dilution of SSW’s common shares. However, it hasn’t kept a lid on the common price, which was $9.31 on 8/30/18. While management lauded the new alliance with Fairfax, that share dilution is something for common shareholders to be aware of. Trade War Fallout – If the current trade war continues to escalate, it could dampen demand for SSW’s vessels, which could pressure earnings. Given the coverage cushion, payout and liquidation seniority that the preferreds have, this is one more reason to favor them over the common shares. After undergoing a decline in 2014-2016, and the Hanjin bankruptcy, the shipping container industry began to rebound in 2017. 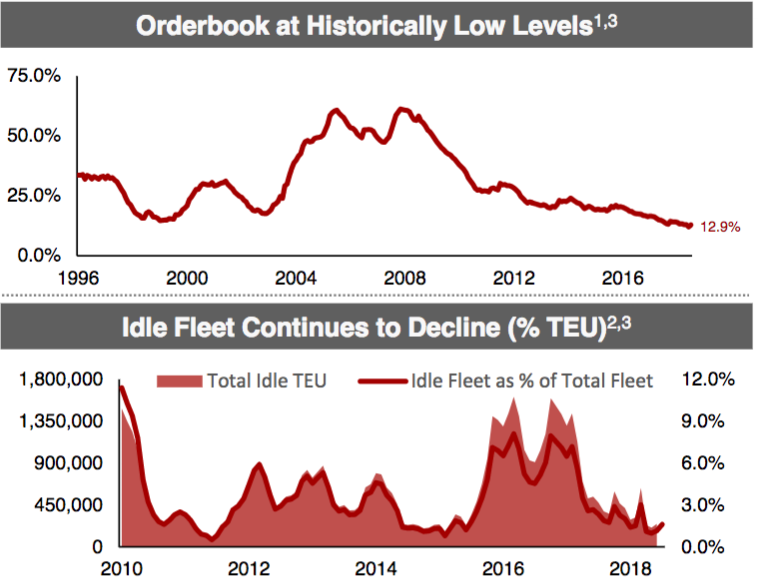 Newbuild orders have tapered off and are at historically low levels, and the percent of idle vessels has continued to fall to much lower levels. SSW’s management has improved the company’s ROA, ROE, and Operating Margin over the past 2 quarters, but its trailing debt leverage has increased. Trailing net debt/EBITDA stood at 7.56X as of 6/30/18, but, in light of the big increase in EBITDA from SSW’s new vessels, it seems reasonable to look at this leverage with a different measurement – net debt/annualized quarterly EBITDA. 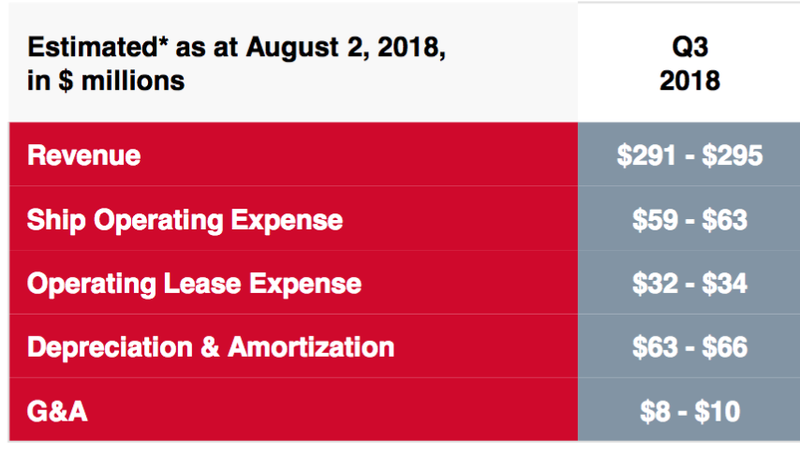 Based upon Q2 ’18 EBITDA of $178.62M, SSW’s leverage was 5.98X, as of 6/30/18. SSW took on more debt in order to finance the GCI vessels acquisition, which pushed its total borrowings up to $4.54B as of 6/30/18, vs. $3.13B a year earlier. Management is focused the company’s leverage – they made a move to lower its cost of capital, by redeeming its 10.5% Preferred F shares on 7/23/18, after the end of the quarter. We don’t currently recommend selling options on SSW’s common shares, but you can see over 25 other trades daily in our public Covered Calls Table and over 30 trades in our Cash Secured Puts Table. We continue to rate the SSW-H preferreds a buy, based upon their strong coverage and attractive yields. All tables furnished by HiddenDividendStocksPlus, unless otherwise noted. CLARIFICATION: We have two investing services. Our legacy service, DoubleDividendStocks, has focused on selling options on dividend stocks since 2009. Disclosure: I am/we are long SSW.PH. (Reuters) – Salesforce.com Inc reported a 27 percent jump in quarterly revenue on Wednesday, as customers looking to rein in costs boosted demand for its flagship Sales Cloud business. 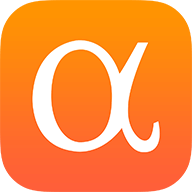 GAAP diluted earnings per share also benefited by 18 cents related to the partial release of tax valuation allowance as a result of the MuleSoft acquisition, the company said. Total revenue rose to $3.28 billion from $2.58 billion. (Reuters) – U.S. cable and satellite TV providers Altice USA Inc (ATUS.N) and Dish Network Corp (DISH.O) have urged U.S. regulators not to approve the planned merger between T-Mobile US Inc (TMUS.O) and Sprint Corp (S.N) in its current form, according to filings published on Tuesday. The $26 billion deal between the two U.S. wireless carriers, which would shrink the wireless market to three big players from four, faces a review from the Justice Department and the Federal Communications Commission (FCC). In the filing with the FCC, Altice said it opposed the merger and called for the regulator to put conditions on the deal, including requiring the combined T-Mobile to honor its partnerships with Altice and other companies that rely on its network, and even divest wireless spectrum that the companies can use. In a separate filing, Dish said the merger would likely increase prices for consumers and that T-Mobile and Sprint have overstated their argument that the carriers need to combine to build a 5G network, the next-generation wireless network that is expected to bring faster data speeds. T-Mobile and Sprint have previously cited cable companies such as Comcast Corp (CMCSA.O) and Charter Communications Inc (CHTR.O), which are entering the wireless industry, as evidence of growing competition. The Communications Workers of America, a union that represents some telecommunications workers, also said in a separate FCC filing on Monday that the merger will result in more than 28,000 job losses. In response to the FCC filings, T-Mobile and Sprint said in a joint statement on Tuesday that they were confident the merger will create more competition and be positive for consumers. My high-conviction investment thesis in Royal Dutch Shell (NYSE:RDS.A) (NYSE:RDS.B) is based on three success pillars. The first pillar is growth in net income, accompanied by a significant rise in free cash flow. The second pillar is shareholder friendliness, or how well Shell treats its shareholders. The third pillar, as in with every investment, is the current compelling valuation of shares. 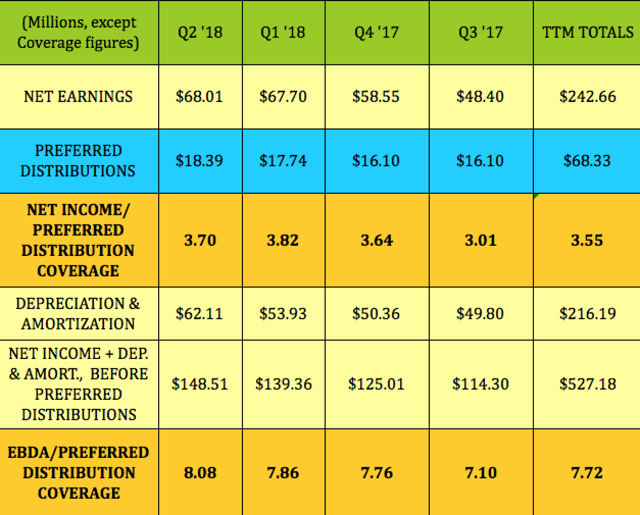 In its most recent quarter, Shell generated net income in the amount of $4.7 billion, an increase of 30 percent over the same quarter last year. The company’s growth is well balanced between its different divisions. 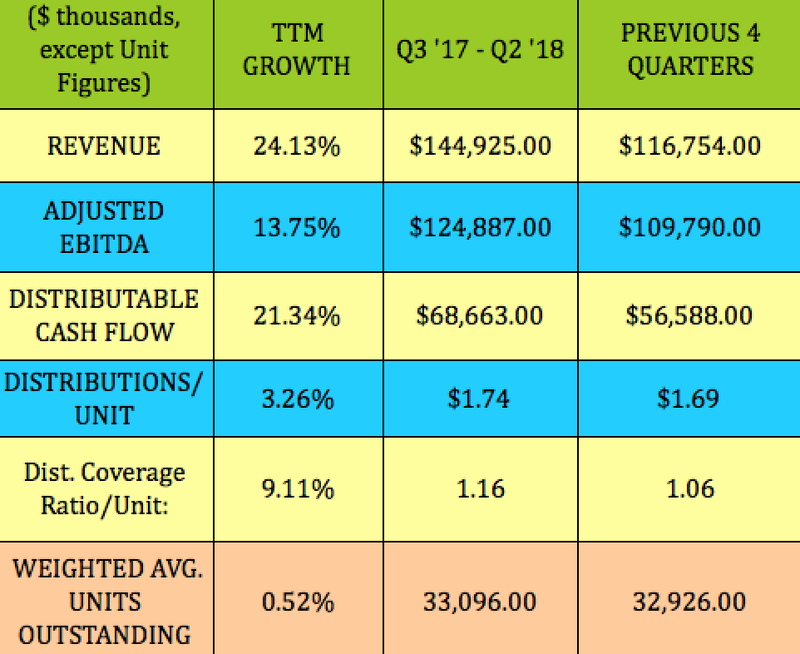 The upstream division (oil exploration) generated adjusted net income of $1.45 billion compared to a meager $339 million during the second quarter of 2017. The company’s integrated gas division (gas exploration and LNG) recorded $2.3 billion in net income, almost double the net income recorded during same quarter last year. But Shell doesn’t only grow its net income. It also generates free cash flow at a rapid clip. The company generated free cash flow of $9.5 billion during the most recent quarter. 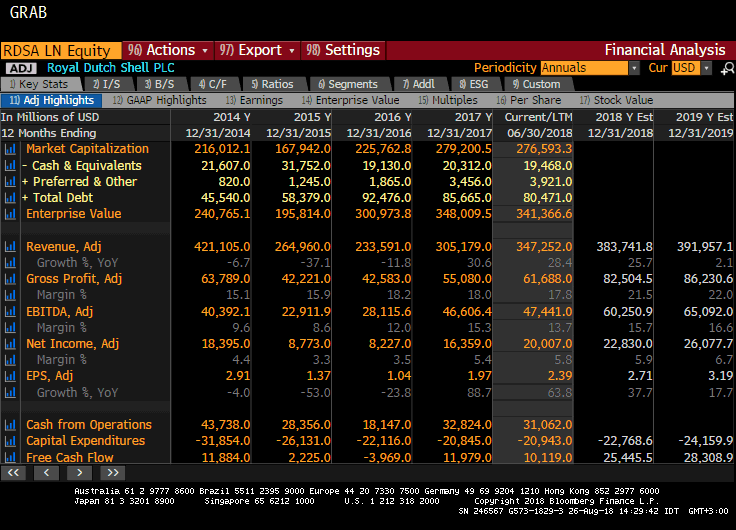 If you look at the first six months of 2018, you’ll see that Shell has generated a total of $18.9 billion in net adjusted income. This marked the most profitable six months in the company’s history. Shell hasn’t always been so focused on profits. In the not-so-distant past, growth in revenues used to reign supreme. Shell, like other oil majors, used to chase whatever oil assets it could get its hands on, regardless of the future return on investment. Only naturally, profits were in constant decline despite a surge in revenues. But Shell has been reformed. As a result of the brutal decline in the oil price compared to its price back in 2014, the company’s management has declared a special strategic shift. From that point on, the focus was on profits, not on revenues. Period. As a result of this transformation, Shell has been selling idle oil assets, cutting its headcount substantially, and reducing its traditionally high leverage. The transformation is apparent in the numbers. During the first six months of 2018, the company has sold marginal oil assets for a total consideration of $3.8 billion. The emphasis on efficiency is also apparent from the 8.1 percent return on investment compared to only 4 percent in the first half of 2017. Some of that cash has been responsibly funneled towards a reduction in debt. Gearing level has been reduced to 23.6 percent compared to 25.8 percent in the second quarter of 2017 and north of 30 percent two years back. Shell doesn’t have a stellar record of being a shareholder-friendly company. Despite its massive cash flow from operations, it has neglected to increase its dividend payouts accordingly, it has consistently diluted shareholders by issuing shares in the form of stock dividends, and has never in its history repurchased its own shares to unlock value. But all this has changed. As part of the company’s strategic shift, management vowed to put shareholders in the front seat. In its most recent quarterly report, Shell disclosed that it had paid a total of $3.9 billion in dividends to its shareholders during the last quarter. Even more importantly, management had announced that it would launch an impressive buyback program in the amount of at least $25 billion to be implemented in the period between 2018 and 2020. This buyback program is subject to further progress with debt reduction and oil price conditions, and is the first buyback program in the history of Shell. Also worth noting is the fact that it has ceased to pay dividends in stock. Since last December, all dividends have been in cash, and cash only. For me, this was a great indication that the company has finally turned around. 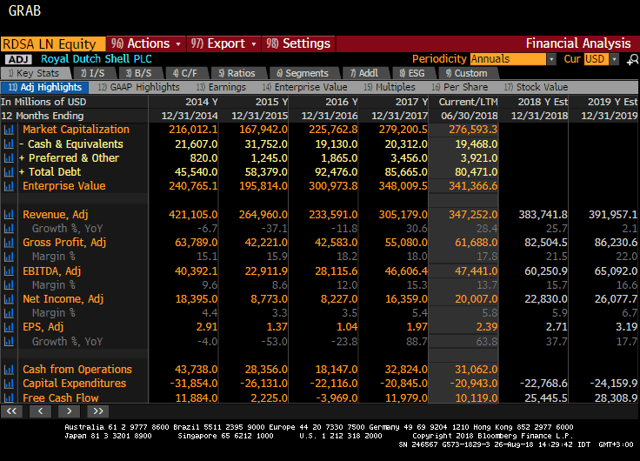 With buybacks and dividends on the rise, I believe that shareholders are expected to receive roughly $25 billion back from Shell, each and every year, between now and the end of 2020. Now, that’s a staggering sum. “T” or “S” – Which One Would You Choose? Most dividend seeking investors sing the praises of AT&T (T). I don’t blame them. AT&T has a stellar record of paying dividends back to its shareholders, in good and bad times alike. But I believe that currently, Shell’s dividend is highly superior to that of AT&T’s for two reasons. The first reason is the industry. The telecom industry has experienced a massive wave of consolidation, and AT&T is no different. The company has recently swallowed Time Warner in an $85 billion deal. Despite the high-quality assets of Time Warner, every major buyout takes its toll. I am confident that AT&T will not pursue any share repurchase program in the coming years. In addition, it will keep its dividend increases to the minimum. In contrast, Shell will pursue aggressive buyback programs, which will reduce the share count, and will increase its dividend by at least 7 percent per annum. The second reason is valuation. Despite the recent uptick in oil prices, oil exploration companies are still selling on the cheap. Specifically, Shell is trading at a lowly 10 times next year’s earnings. This represents one of the lowest valuations in the company’s history. Especially notable is the contrast between the gradual rise in revenues and profits per share (white and green line, respectively) versus the sharp decline in valuation (brown line). This is precisely the setup that I like the most. You see, investing is all about contemplating the present and projecting it into the future. That’s why I believe that Shell’s 5.5 percent dividend yield is highly superior to AT&T’s 6 percent dividend yield. 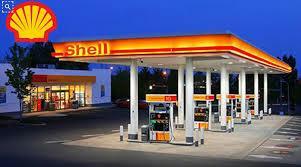 Shell is a leading company in the oil exploration sector. It gushes cash flow, grows net income at a rapid pace, and treats its shareholders very well. I believe that at current valuation, and considering future prospects, its dividends are by far superior to that of AT&T. Disclosure: I am/we are long RDS.B. I like monitoring dividend increases for stocks on my watch list of dividend growth stocks because I consider such stocks to be candidates for further analysis. Companies can only increase their dividends sustainably if earnings grow sufficiently. In the past week, four companies announcing dividend increases passed these screens, including one of the stocks I own. The table below presents a summary of these increases. BANF is a financial holding company that conducts all of its operating activities through its principal wholly-owned subsidiary, BancFirst, a state-chartered bank in Oklahoma City, Oklahoma. BANF operates through 4 principal business units: metropolitan banks, community banks, other financial services and executive operations and support. On Friday, August 24, the company increased its quarterly dividend by 42.86% to 30¢ per share. The dividend is payable on October 15 to shareholders of record on September 28. BANF will trade ex-dividend on September 27. MO was founded in 1919 and is headquartered in Richmond, Virginia. The company manufactures and sells cigarettes, smokeless products, and wine in the United States. In March 2008, MO spun off the subsidiary Philip Morris (NYSE:PM) to protect it from litigation in the United States. Recently, MO increased its quarterly dividend to 80¢ per share, an increase of 14.29% over the prior dividend of 70¢ per share. The dividend is payable October 10, with an ex-dividend date of September 13. SYBT operates as a bank holding company for Stock Yards Bank & Trust Company, a state chartered bank with operations in Louisville, Indianapolis, and Cincinnati. The company operates in two segments, Commercial Banking and Wealth Management and Trust. SYBT was founded in 1904 and is headquartered in Louisville, Kentucky. Recently, the board of directors of SYBT declared a quarterly dividend of 25¢ per share. The new dividend represents an increase of 8.70%. SYBT will trade ex-dividend on September 14. The dividend is payable on October 1, to shareholders of record on September 17. WY is a real estate investment trust that invests in timber, land, and forest products, primarily in the United States. The company owns timberlands in the USA and has long-term licenses in Canada. It manufactures wood and specialty cellulose fibers products. WY was founded in 1900 and is based in Seattle, Washington. On Friday, August 24, WY increased its quarterly dividend to 34¢ per share, an increase of 6.25%. The first payment will be on September 28 to shareholders of record on September 14. The ex-dividend date is September 13. Below, I’m including charts from F.A.S.T. Graphs for three of this week’s dividend raisers, BANF, MO, and SYBT. 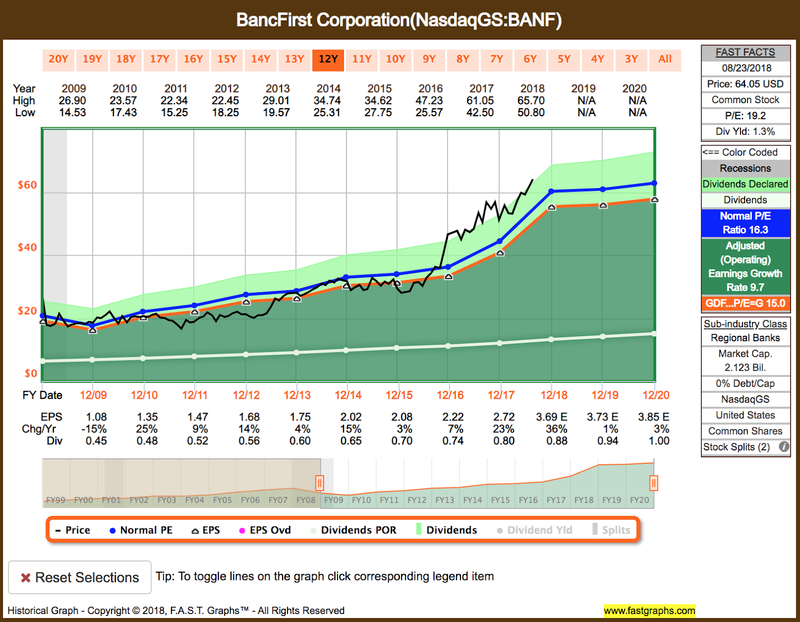 BANF’s price line (black) is above the primary valuation line (orange) and above the stock’s normal P/E ratio (blue). The stock is trading at a premium to fair value. An investment in BANF in January 2009 would have returned 10.6% on an annualized basis (with dividends included). 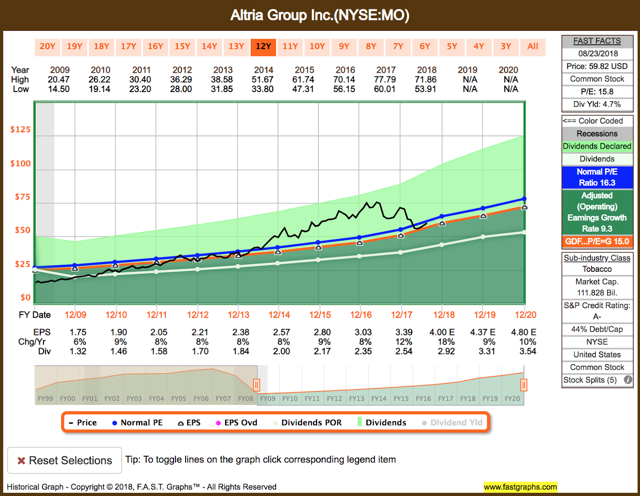 MO’s price line is below the stock’s normal P/E ratio and above the primary valuation line. The stock is trading at about fair value. An investment in MO in January 2009 would have returned 18.5% on an annualized basis (with dividends included). 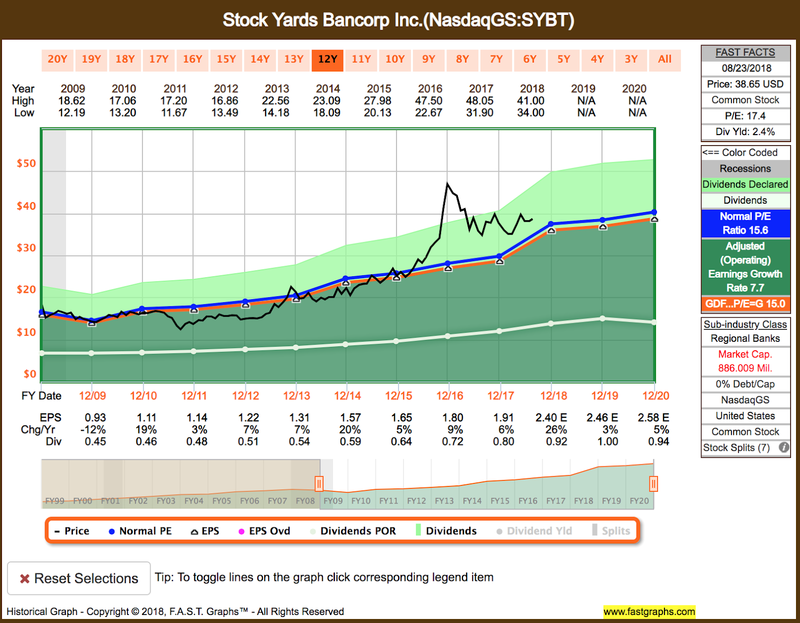 SYBT’s price line is above the primary valuation line and above the stock’s normal P/E ratio. The stock is trading at a premium to fair value. An investment in SYBT in July 2010 would have returned 9.5% on an annualized basis (with dividends included). The table is sorted by Ticker, and as before, Next Div is annualized. 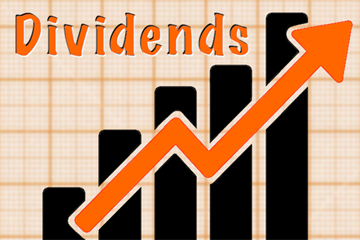 Please note that Next Div links to the latest dividend declaration announcement. Disclosure: I am/we are long D, LMT, MCD, MO, NEE, O, QCOM, SWK, TRV. In this series, we start with a fairly simple question. If we were to invest in five large-cap, safe, and dividend-paying companies trading at relatively cheap valuations, which companies would make the cut at the given moment? Note: In our opinion, for a well-diversified portfolio, one should have 15-20 stocks at a minimum. Before we get to the selection process to select five companies, we should be clear in our objectives. Our primary goal is income, and the secondary goal is to grow the capital. These goals are by and large in alignment with most income investors as well as DGI investors. A balanced DGI portfolio should keep a mix of high-yield, low-growth stocks along with some high-growth but low-yield stocks. However, how you mix the two will depend upon your personal situation, income needs, and time horizon. Whatever your final goals may be, we are trying to shortlist and highlight five stocks that may fit most such investors. However, as always, we recommend you do your due diligence before making any decision on them. The S&P 500 yields less than 2%. If we are dividend investors, we should logically look for companies which pay yields that are at least higher than the S&P 500. Of course, higher the better, but at the same time, we should not try to chase high yield. If we try to filter for dividend stocks paying 2.0% plus dividend yield, there are more than 1500 such companies trading on US exchanges including OTC networks. If we further limit our choices to companies which have a market cap of at least $30 Billion and daily trading volume in excess of 100,000 shares, the number comes down to just 177 companies. Furthermore, if we were to choose stocks that are trading at a forward P/E of no more than 20, and had at least 1% dividend growth in the last five years while meeting all other criteria, we will still get a list of 94 companies. We may like to point out that a P/E of 20 is not essentially cheap. However, with the current P/E for the S&P 500 hovering around 24.75, a P/E of 20 is relatively cheap. But that’s not all. In our quest for not paying too high a price, we add one more criterion that the close price is at least 15% below the 52-week high. After applying these additional criteria, we get a set of 38 companies. Out of a list of 38 companies, the final step to narrow down the list to five stocks is subjective. We will need to do further research on factors like dividend safety, growth prospects and economic-moat of the company. We selected five companies (out of 38), from different sectors/industries ranging from very safe companies like Illinois Tool Works (ITW) to possibly a more controversial choice like Kraft Heinz Co. (KHC), which offered a much higher discount. We think these companies as a group would be appealing to retirees, near-retirees or anyone above 50 years of age. As we get closer to retirement, our focus changes from the growth of capital to income. Though we selected five stocks, however, there are other stocks on this list that may be equally appealing. In fact, there may be quite a few others. Below is the complete list of 38 companies that we got by using the above criteria. Out of these, we selected five companies (highlighted) from different sectors/ industry segments. The last step in this selection process (choosing five companies out of 38) is selective and based on our research and opinion. Please note there may be other companies on the list that may be equally compelling, that’s why we provided the complete list for the benefit of readers. KHC is an American food and beverage company formed in 2015 by the merger of Kraft Foods and Heinz. The merger was backed by 3G Capital and Berkshire Hathaway, and they together invested US$46 billion in the deal. The company boasts of 8 brands with billion-dollar-plus annual sales. The Company’s brands include Kraft, Heinz, ABC, Capri Sun, Classico, Jell-O, Kool-Aid, Lunchables, Maxwell House, Ore-Ida, Oscar Mayer, Philadelphia, Planters, Plasmon, Quero, Weight Watchers Smart Ones and Velveeta. In our view, KHC may not be the best company among the consumer staples companies, but its shares have taken the most beating. So, it stands out on the valuation front. For example, the prospect of Unilever (UL) is expected to be much better, but then its shares are not cheap and have stood the ground during the consumer staples downturn recently. KHC may be a good example of “buying low” now and “selling high” later (or keep earning high dividends) strategy. But, it should be noted that shares of other companies in the Consumer Staples segment like Proctor & Gamble (PG) and Colgate (CL) are also trading at attractive valuations, but the discounts are not as steep as they are for KHC. Obviously, we would consider KHC safe enough, but not as safe as more stable names like PG, and Unilever. Shares of KHC are trading at about -29% compared to its 52-week high. The consumer staples segment, in general, is pressured by the stagnant sales and contracting margins. That is one reason that valuation is relatively cheap. However, not all companies are equal. KHC’s forward P/E is only 16.29 compared to 23.0 for Unilever and 19.0 for Proctor & Gamble. The forward dividend yield of 4.10% is also very attractive and much higher than more its 3-year average of 2.72%. The company is a leading semiconductor company with annual revenue of $17.5 Billion and the ninth largest holder of patents among the top semiconductor vendors. In January 2016, the former Broadcom Corporation was acquired by Avago Technologies, and the combined company was renamed Broadcom Inc. However, Avago retained the ticker “AVGO” of Avogo for the combined company. The combined company is a leading semiconductor company with annual revenue of $17.5 Billion and the ninth largest holder of patents among the top semiconductor vendors. In 2005, the chip division of Agilent Technologies was acquired by two private-equity-funds to form Avago Technologies. Since then, the company has grown bigger and bigger on its strength an acquisition strategy. In 2016, it announced its intention of acquiring Brocade Communications. To avoid the foreign investment review, it re-domesticated from Singapore to Delaware. However, its proposal to acquire Qualcomm in 2017 did not go well and was finally blocked by President Trump on national security concerns. However, it has moved on and announced its intentions in 2018 to acquire CA Technologies for $18.9 billion. Since then its share price has dropped more than 15%. Shares of AVGO are trading at -26.5% below its 52-week high. The forward P/E is 10.80. The forward dividend yield of 3.34% is very attractive and more than double of its 5-year average of 1.45%. ITW needs no introduction to DGI investors. It has paid and increased dividends for 54 years, and for this reason is known as a Dividend Aristocrat. ITW was founded in 1912 and is a Fortune-500 company. The company produces engineered fasteners and components, equipment and consumable systems, and specialty products. It employs nearly 50,000 people across 56 countries and generates nearly half of its $14 Billion revenue outside of the US. The 5-year dividend growth has been excellent at 14.20%. Valuation of ITW is relatively cheap right now. The share price fell considerably after the second quarter results due to lower guidance. Shares are trading at -22% cheaper compared to its 52-week high. Its forward P/E is 18.21 compared to 5-year average of 21.5%. The forward dividend yield of 2.87% is also attractive compared to its 5-year average of 1.97%. PRU is an American Fortune 500 company and provides insurance, investment management, and other financial products like life insurance and annuities and services to both retail and institutional clients in the US and many other countries. It provides these products and services to both individuals and institutional clients. Prudential has operations in the US and at least 30 other countries. The company primarily operates through hundreds of subsidiaries and organizes its operations in three segments- Financial Services, Businesses, and the Closed Block Business. Shares of PRU are trading at -21% discount compared to its 52-week high. Its forward P/E is only at 8.13. The forward dividend yield of 3.64% is also very attractive compared to its 5-year average of 2.84%. Dominion Energy is one of the largest Utility companies and considered best of the breed among utility companies. It serves more than 6 million utility and retail energy customers and has a portfolio of approximately 25,700 megawatts of electric generation, 15,000 miles of natural gas transmission, gathering, storage and distribution pipeline and 6,600 miles of electric transmission and distribution lines. Dominion also operates one of the largest natural gas storage systems in the U.S. with 1 trillion cubic feet of capacity. Dominion Energy’s proposed stock-for-stock merger of SCANA Corporation (NYSE: SCG) is still pending. The merger is expected to be accretive to Dominion Energy’s earnings upon closing. Dominion is considered to be one of the safest dividend-paying utilities by the DGI investors. The utility sector, in general, is down by a lot in the recent months, though it has recovered to some extent recently. The current valuation of Dominion is relatively cheap. Shares are trading at -15.5% below its 52-week high (we highlighted it first in our June article when it was trading -26% below its 52-week high). Its forward P/E is 17.73. The forward dividend yield of 4.66% is still very attractive to its 5-year average of 3.66%. **KHC as a merged company (merger of Kraft and Heinz) has a history only since 2015. 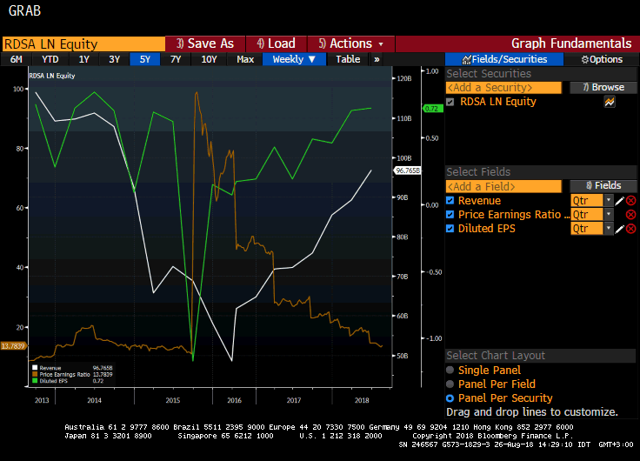 ##For both KHC and AVGO, EPS figures have been very volatile, and due to limited history after respective mergers, the growth data is not reliable. As of January 2018, the average dividend yield of these five stocks was 2.82%. Not bad for a mostly conservative lot. However, if you were to buy these five companies today and invest equal amounts, you would get roughly 3.72% dividend, nearly 32% more. Not much has changed with regards to the quality of these companies. Even the S&P 500 is trading at similar levels as in January 2018. What has changed is the market perception. Generally, some of these sectors have been out of favor in recent months. So, we think that we should take advantage of lower prices. These five companies as a group, the average yield is 3.72%, up 32% from 2.82%, and the average price is 18% lower compared to the beginning of the year. We offer “High Income DIY Portfolios” Marketplace service. The primary goal of the service is high income with low risk and preservation of capital. The service provides the DIY investors with vital information and portfolio & asset allocation strategies to help create stable, long-term passive income with sustainable yields. We believe this service is appropriate for income-seeking investors, including retirees or near-retirees. We currently provide five portfolios, including two ‘High-Income’ portfolios, a conservative strategy for 401-K accounts, a ‘Sector-Rotation’ strategy, and a ‘High-Growth’ portfolio. For more details, click here. Disclosure: I am/we are long CL, KHC, D, ITW, PG, UL. Looking for a solid, high-yield niche play? Maybe you should consider Hoegh LNG Partners LP (HMLP), the only publicly traded pure play on FSRUs. FSRU stands for “Floating Storage & Regasification Unit,” and it’s a rapidly growing presence in the LNG shipping industry. HMLP’s parent/sponsor, Höegh LNG Holdings Ltd., is the largest provider of FSRUs in the market. FSRU leasing/chartering solves many problems for charterer companies and countries. It’s slow and expensive to build an LNG import terminal, so FSRUs are being increasingly used to give countries access to LNG. Like many of the firms we cover, HMLP operates on long-term contracts – its current average is 10.75 years for its five-vessel fleet, which includes two JV vessels. This is among the longest contract tenures that we’ve run across in the shipping industry. HMLP pays in a Feb-May-Aug-Nov. cycle and should go ex-dividend again in early November. At $18.25, the common units yield 9.64%. 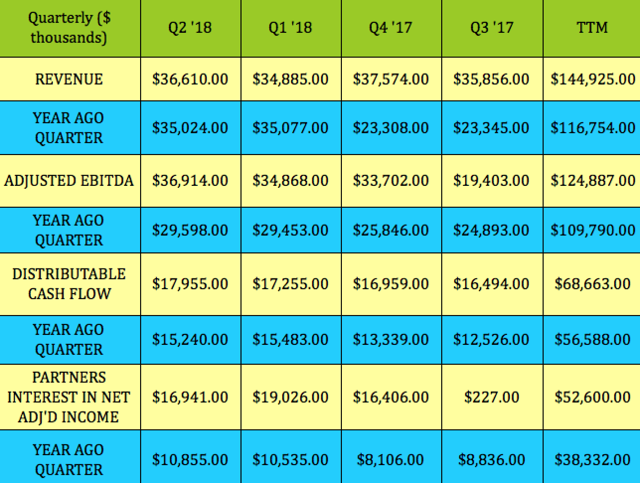 In 2017, HMLP’s ROC ranged between $.188 and $.1979 per quarterly payout. Investors get the benefit of sheltered income, but ROC does decrease your basis, so take a look at this if you’re thinking of selling at some point down the road. 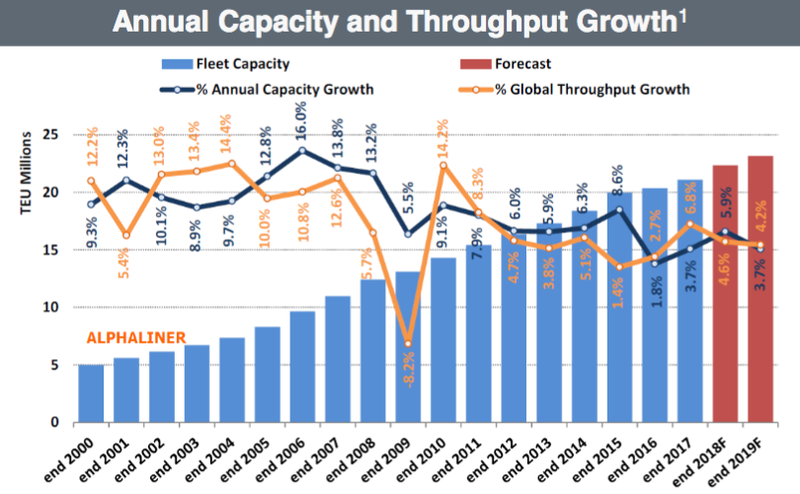 HMLP also has a preferred series, Hoegh LNG Partners LP 8.75% Cumulative Perpetual Redeemable Units Series A (HMLP.PA). These are cumulative preferred units which offer you the additional protection of knowing that management must pay you any skipped distributions before it pays the common units. These units also rank senior to the common units in the event of a liquidation. At $25.55, these preferred units yield 8.56%. HMLP has had strong growth in EBITDA, DCF, and net income over the past three quarters, with EBITDA up 24.72%, DCF up 17.81%, and net income up 56.07% in Q2 ’18. The 56% jump in net income is due to HMLP owning 100% of the Höegh Grace vessel in 2018, vs. only 51% in 2017. HMLP has two operating segments – majority held FSRUs, which contributed $58.58M in segment EBITDA for Q1 -2 ’18; and joint venture FSRUs, which contributed $16.39M in segment EBITDA for the same period. Boil-off issue – As we reported previously, HMLP has a “boil-off” problem. This still hadn’t been resolved, as of 5/31/18, when they reported Q1 2018 earnings. The charterer of the Neptune and Suez Cape Ann vessels filed a claim vs. these vessels, for excessive, past “boil-off.” The vessels are allowed a certain amount of LNG boil-off, (it’s related to gas which is ultimately being lost during a passage – in this case, it was when the vessels were being used for LNG transport years ago, before they were converted to FSRUs), but the charterer claims that they didn’t meet the performance standards for their contracts. HMLP’s 50% share of the accrual was approximately $11.9 million as of June 30, 2018. However, HMLP is being indemnified by its parent company HLNG. “The process has been a bit in limbo during the transition between NG and Total, but I think now Total have closed that transaction. We should be able to come to some kind of agreement on that in relatively short order. HMLP’s parent, HLNG, has additional FSRUs which it could eventually drop down to HMLP. However, it has been involved in lengthy contracting talks for some of its vessels. Management has previously indicated that they’d like to acquire a dropdown asset at least once each year. At $18.25, HMLP common units are 4.45% below the lowest price target of $19.10, and 12.09% below the average $20.76 price target. Like many other shipping stocks, HMLP has been underperforming the market in 2018, although it has outperformed the benchmark Claymore/Delta Global Shipping ETF (SEA). HMLP has a slightly lower, but still very attractive yield, and better distribution coverage than other LNG carriers. It seems to be getting a slight premium for its better coverage in its price/DCF and price/book valuations. This is good to see – HMLP’s ROA, ROE, current ratio, and operating margin have all improved over the past few quarters, while its debt leverage has become much lower. Management has chopped net debt/EBITDA down from a 5.1X level as of 9/30/17, to a 3.5X level, which is much lower than the 5.41X industry average. The balance on HMLP’s revolving credit facility line will be further reduced in Q3 ’18, as a result of a $6M repayment made after the close of Q2 ’18. 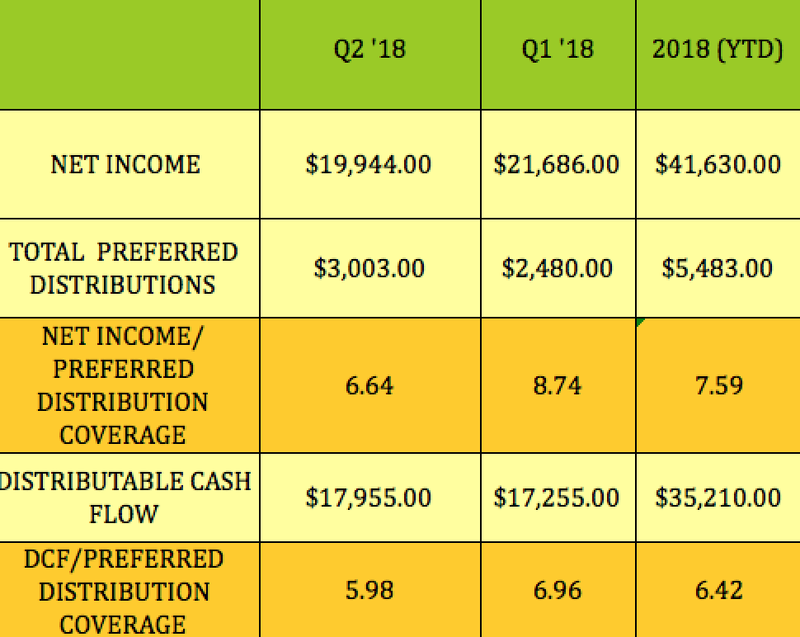 As of June 30, 2018, HMLP had cash and cash equivalents of $21.0M and an undrawn portion of $39.7M of the $85M revolving credit facility. HMLP doesn’t have options, but you can see over 25 other trades daily in our public Covered Calls Table and over 30 trades in our Cash Secured Puts Table. We rate HMLP a buy, based upon its attractive, well-covered yield, and conservative debt management. Disclosure: I am/we are long HMLP. Someone on Twitter first noticed the program. TechCrunch followed up on it, finding a dozen of the accounts, all supposedly belonging to “real” Amazon workers, all using the same template and Amazon smiley logo. My immediate impression — and I saw later some used the same metaphor — was that the Stepford Wives took jobs at Amazon and continued to work in lockstep. But to understand the how badly this program has been designed, you need context, so it’s time for a trip down memory lane. Fear of being disciplined for not working hard enough. Workers claiming to have been penalized for not showing up even though they were sick. Some feeling so pressured that they urinated in bottles to avoid taking off the time to get to a bathroom. One temporary worker said her vision got blurry, she had trouble standing and couldn’t concentrate one shift when heat in some parts of the warehouse exceeded 110 degrees. She went to a nurse station in the warehouse because she was feeling dizzy. Within minutes of her arrival at the nurse station, an ISS manager asked her to sign a paper saying her symptoms were not related to work, she said. The employee takes medication for hypertension and signing the papers, she said, would allow her to return to work after cooling off. And, among other things, more stories of no time for the bathroom. PR people are often called on to spin stories to keep clients or employers from looking bad. To say the equivalent of “false news” about a long string of stories over the years doesn’t do the job. Not hired, offered. We are all actual warehouse employees who do the same thing as everyone else in the facilities. We are giving our stories to help people understand what its really like working here vs. what media sites want everyone to believe (because they dont work here). This is a full time position. We were given this opportunity to talk about the work life here. I worked in our packing department, and Jemery worked in Stowing (inventory). These are our real and true experiences we are sharing. And no, there is no bonus. This was optional to do. What makes this such a bad approach is that the entire thing screams fake, even if it isn’t. You have people whose new job is to say nice things about the company. By focusing on only their past experiences, Amazon effectively tries to pretend that others might not have faced something much more unpleasant and even dangerous. Part of the campaign apparently is to tout chances to visit an Amazon fulfillment center. Preferably one with A/C. It’s bad enough to try and pretend that any criticism is 180 degrees from reality. That demands a suspension of disbelief and the assumption that every current or former employee who talks about bad conditions is lying. Perhaps the world is always ready for another conspiracy theory. this amazon fc ambassador thing is insane, think of how much some exec is getting paid for inventing for this pointless scheme vs the dregs being offered to the fulfillment center workers that are put up to this. The speakers in all the Amazon warehouses blare music constantly. All the lyrics are about how hard work is its own reward and how we should sacrifice everything for the company. Jeff Bezos calls it “toilcore.” He’s very into it. Examine them and your operation for any truth. If there is any, figure out how to solve the problem. Work with a crisis communications expert and listen to the advice. You don’t know better. Implement the recommended communications plan, including addressing real problems and proving if charges are utterly false. Use transparency to work with the media. If they can see that everything is fine, it deflates additional stories and maybe creates some good earned media. Do not try to pretend everything is fine. You will only have people mercilessly mocking you on social media.